Over the summer, Korea’s SK Telecom outlined its strategy to capitalize on the IoT opportunity. From a networking standpoint, SK Telecom has invested in a nationwide LoRa network. It plans to offer a hybrid offering in parallel with LTE-M over its conventional mobile network. This combination allows SK Telecom to span a wider spectrum of coverage and cost-structure alternatives. Its technology choices use licensed and unlicensed spectrum, support differing data-rates, and, offer a broad range of embedded module costs to deal with barriers to adoption in low price-point (or low perceived value) devices. SK Telcom’s business strategy envisages a set of basic B2B and B2C business models which it then expands (to B2B2B/B2B2C arrangements) to other entities. In the smart home scenario, for example, the other entities include construction, rental and security companies. In the context of its other service offerings, it is important to note that SK Telecom has laid out an evolution beyond the traditional MNO business of tariffed telco services. Through the introduction of three platforms (for media, lifestyle enhancement and IoT), SK telecom plans to launch a wide range of on- and off-line services through a convergence of these three platforms. In time, the company wants to position itself as an ‘intelligent life partner’, leveraging AI and personalization to offer tailored services across all aspects of an individual’s life. This progression is very much in line with the idea that IoT is a stepping-stone to digital services, which position the company much closer to the higher revenues and value potential that consumers and business partners are willing to pay for. It also forces the company to develop and operate with a different mindset that prioritizes platform business models for eco-systems that include non-telco business partners and service providers. 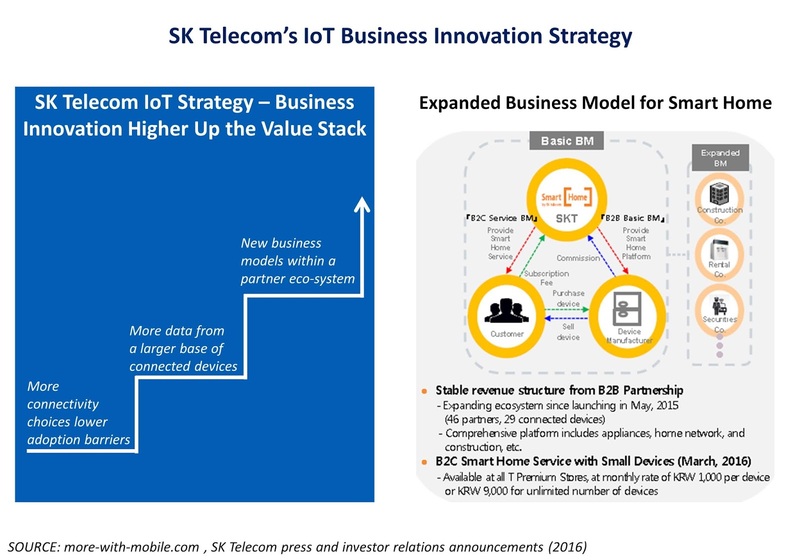 The interesting next-step for SK Telecom is how and when to expand its operational reach into devices and sensors that rely on short-range connectivity technologies. By most estimates, these account for the majority of all IoT devices.